When your internet access was setup up the installer gave you an low-end modem to lower their cost. By now that modem is a few generations out of date and you’re still paying for it every month. To make matters worse cable companies periodically raise their leasing fees without any fanfare. Monthly fees currently average $9 per month. A one time purchase of your own cable modem can save $470 over the course of 5 years (math below*). 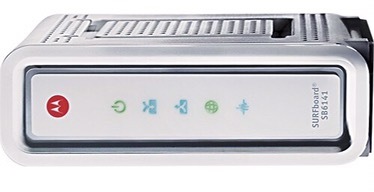 This $70 Motorola Arris modem is top rated and compatible with most providers. Installation is as simple as swapping out your old modem and a phone call for activation. It will improve your connection speed and pay for its self in less than 8 months (more math below**). Your internet experience will improve and your wallet will thank you – easy decision. Get free 2-day shipping with a FREE 30-day trial of Amazon Prime.